Working with SQL for data analysis sometimes requires creating new tables. Do you want to store the output of your SQL queries? Do you need to pull new data sources (eg. csv files) into your analyses? Do you want to store your transformed and cleaned data without deleting your original data sets? First, you have to know how to create new tables in SQL! In this article I’ll show you the CREATE TABLE SQL statement, the syntax, and the different column parameters that you have to set. And at the end of the article, you can immediately continue to the next article where you can learn how to import data into these SQL tables. Before we dig deeper into how to create new tables, we have to talk about a conceptual element of SQL: the different data types. Let’s see what sorts of data we can put into an SQL table! Note: in the current version of PostgreSQL there are more than 40 different data types. Here, I’ll introduce only the seven most important ones. Boolean. A binary value. It can be either TRUE or FALSE. Because when you create a new SQL table, you have to define which data type you will have in each column. And once it’s defined, you have to stick with it. For instance, if you set a new column with an Integer data type, you won’t be able to include text or dates or anything else. This means that you should be conscious about data types and also design your data tables (and databases) before you actually create them! CREATE TABLE is the SQL keyword. You should always have it at the beginning of your SQL statement. The first_column, second_column, last_column, etc. will be the names of the new columns in the new table. The same applies to them as to the new_table_name: simple and meaningful names in lowercase are the best. And here comes the trick – or at least the unusual thing – for every column, you have to specify the data type. As you see, after the first_column there is a first_column_data_type. This could be Text, for instance. But if you wanted to fill it numbers and perform mathematical calculations on them in the future, you should choose numeric data types (eg. Integer or Decimal) instead. Or if you wanted to use datetime functions you should use date/time data types (eg. Date, Time or Timestamp). All these will become much clearer through an example. 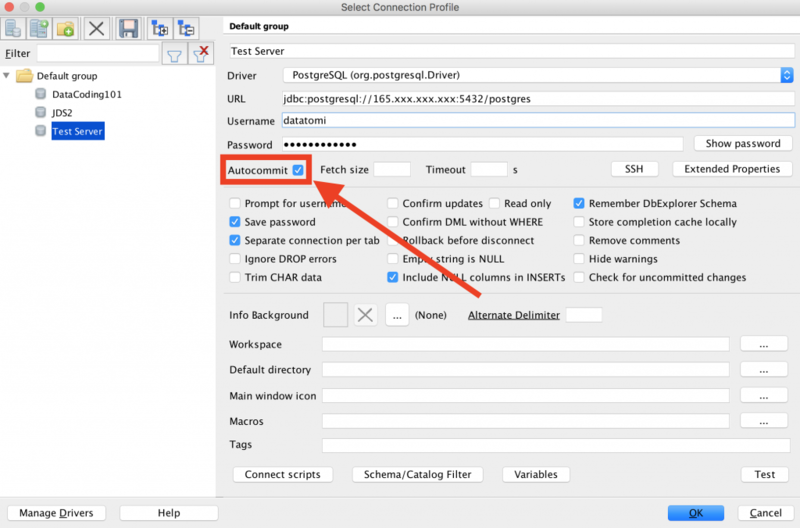 Create a new table in SQL using SQL Workbench (or pgadmin4)! Let’s get back to practice! I assume that you have already gone through the Install Python, R, SQL and Bash article and that you have downloaded and set up either SQL Workbench or pgamdin4. Let’s open either of the two! Note: I’ll work with SQL Workbench here because that’s my favorite SQL manager. Feel free to use your favorite: the process will be the exact same for every tool. Establish the connection to your data server! Now, create a new table using the CREATE TABLE syntax we learned above — replacing the placeholders with real values! I’ll create a table for storing the imaginary chemistry test results of an imaginary class. In this table, I created five columns with four different data types (text, date, decimal, boolean). If I query this new table, I’ll get an empty table. But at least I can see the column headers, so I know that my table has been created! Great success! Don’t forget to commit your changes! One more important thing before we finish! Sometimes, when you create a new table in an SQL query tool (like pgadmin4 or SQL Workbench), you have to publish the changes you made in the tool to your data server. In programming this is often referred as “committing your changes”. I wrote “sometimes” because in most SQL manager tools, there is an auto-commit function, too. You can check whether yours is on or off! In pgadmin, when you are in query mode, you should click the little drop-down button next to your Execute button. 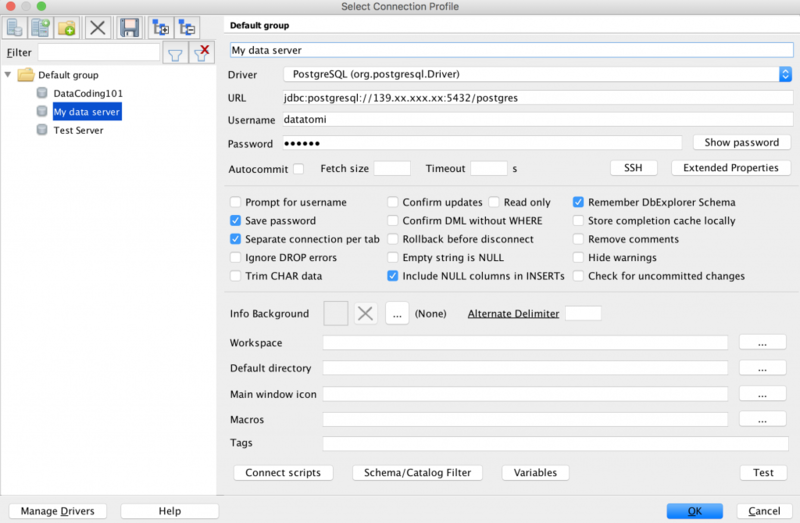 In SQL Workbench, you can set this before you connect to your data server. Then run it… and your changes are committed to the server! Done! Your table is created and the changes happened on your data server, too! 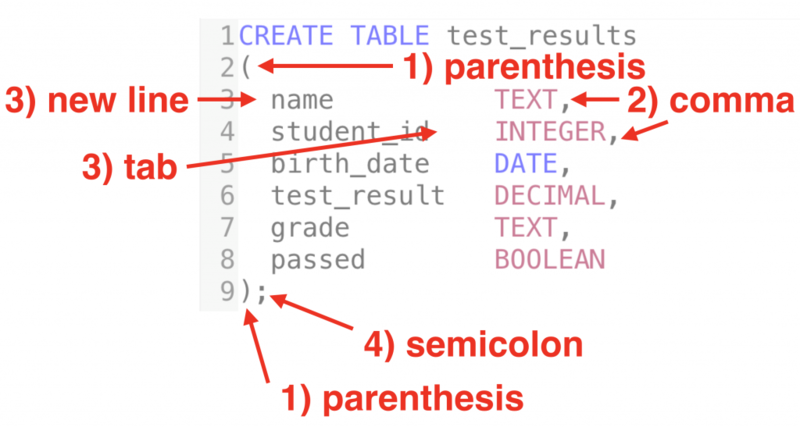 After the CREATE TABLE new_table_name, the column information goes between parentheses. The different columns have to be separated with commas. I personally recommend using line breaks between columns, and tabs between the column names and the data types. Remember, indentations and line breaks do not affect the execution of the SQL statement, only make it easier to read. Don’t forget the semicolon from the end of the SQL statement! If you want to go through the general SQL syntax best practices, check this article! How to delete table in SQL? Deleting a table is even simpler than creating one. NOT NULL: If you add this, you can’t add NULL values to the given column. UNIQUE: If you add this, you can’t add the same value to the column twice. This is especially important when you store unique user IDs, for instance. PRIMARY KEY: Practically speaking, this is a combination of NOT NULL and UNIQUE but it also has some technical advantages. (Let’s not get there yet, though.) You can have only one PRIMARY KEY column per table. In this table, the student_id is a unique value that can’t be null (so I defined it as a PRIMARY KEY) and the test_result, grade and passed columns have to have results in them (so I defined them as NOT NULL). This is how to create tables in SQL. These were the basics that I think you have to know as a data analyst/scientist. For more advanced applications, check out the original PostgreSQL documentation. And now, let’s continue with the How to import data into SQL tables article where I’ll show you three ways to populate the table we have created with data!